Picking your wedding venue is one of the first items you should cross off you wedding planning list (you can see the list we made here!). But how does one go about selecting a venue? What factors go into the decision? What should you focus on when looking and touring? Let me tell you here in this quick guide. First, look at what time of year you want to get married. In South Louisiana, the most popular months to get married are from late January to April, and then again in October and November. The biggest tip to follow when booking and touring venues is to make sure it’s not during a large sports event, because believe it or not, the LSU/Alabama football game will upstage your wedding, especially if you have a lot of football fans. Another reason to assess what time of year you want your wedding is to see what venues have air conditioning and heat. 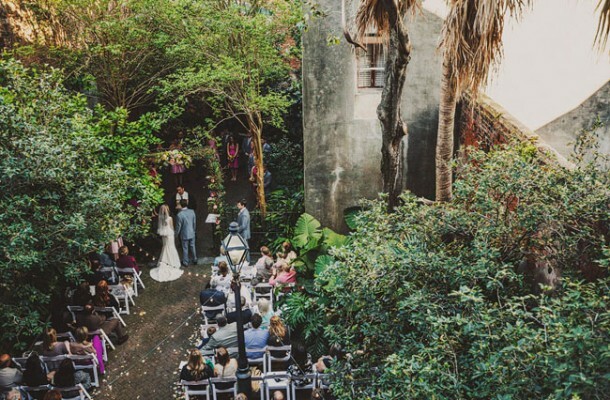 For example, I would not recommend a couple to get married at the LSU Botanical Gardens in July as their facilities are not air conditioned, and you would have to bring in fans to keep your guests cool. I would also ask about backup generators and what rain plans they have (which is a good idea to ask regardless of the time of year, because you never know with Louisiana weather). Other things to take note of and ask about would be parking, travel to and from local hotels (especially if you have a lot of out of town guests), and if there is a preferred vendor list that the venue exclusively works with. Assessing the style of wedding you want will also go a long way in what kind of venue you will be needing. Like the rustic, but more Joanna Gaines than Pioneer Woman? Check out the White Magnolia, which lends itself to be more formal than casual. Options like the Berry Barn or the Cedar Post Barn are certainly more casual venues. More classic and formal venues to look at would include The Hilton Hotel or the Watermark Hotel, both in Downtown Baton Rouge. For that Old South, grand Plantation aesthetic you cannot go wrong with Nottoway Planation and Resort or White Oak Planation, as well as the numerous historic homes and mansions that are in St. Francisville, Louisiana. Besides the appearance of the venue, ask yourself how do you want your guests to dress and the level of formality? Some venues tend to lend themselves to be more black tie appropriate rather than business casual or summer cocktail, so as your researching options I would keep apparel in mind. One of the best tips though in regards to picking a venue: be realistic of what would fit your budget. Don’t be afraid to ask about pricing before going for a tour, and be upfront with what your budget is when talking to prospective venues. I like to think of it in terms of wedding dress shopping: don’t go trying on things if you know they are out of budget, and don’t convince yourself that you can trim other parts of your budget to accommodate another item. It is always better to err on the side of caution when you are looking at a part of your wedding that will eat up a large portion of your budget. Lastly, however, is my biggest and most important word of advice in regards to not just your venue, but your wedding…stay true to yourself and who you are as a couple. Being unhappy with your venue can cause a damper on every aspect of your wedding, and create stress and unhappiness throughout the planning process because you went with something that you didn’t quite love. Choose with care and consideration; don’t just pick a venue because it’s cheaper, but know that you’re investing in your wedding experience and setting a precedent for the rest of your planning. Friends, if you ever have any questions, please feel free to reach out! I’d be happy to lend you some advice in regards of what to do or what to look for when selecting your venue for the big day!